Since I am working with a class on a research project, I have daily reminders about the history of the people and places associated with Middle Tennessee State University. Although I usually avoid the word “miscellaneous,” I thought it an appropriate title for today’s blog, which explores some of the many people significant in MTSU’s history. Middle Tennessee State University started out as Middle Tennessee State Normal School. It was authorized by the General Education Bill of 1909, and the school opened on 11 September 1911. The first president was Robert Lee Jones, who served until 1922. Jones Hall is named for him. 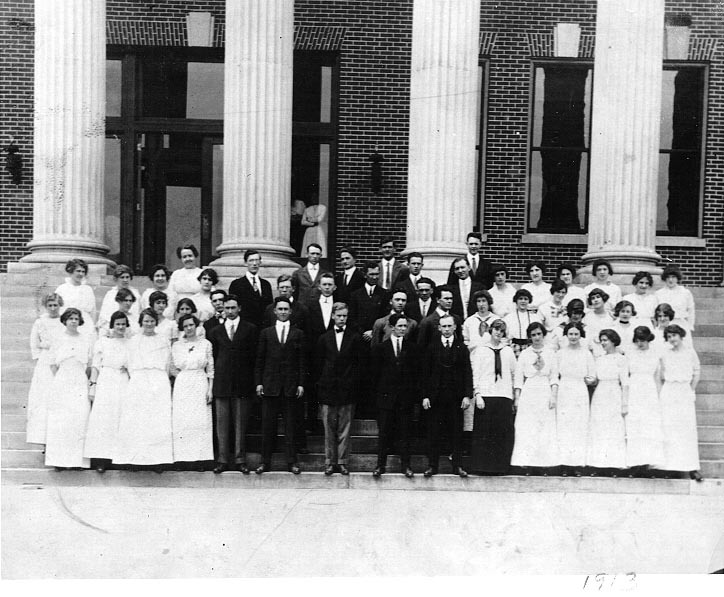 There were nine students in the first graduating class in 1912. Seven received normal diplomas, and two received academic certificates. The graduates are listed in the Bulletin (class schedule or catalog) of Middle Tennessee State Normal School Bulletin, June 1912. Ten presidents have served since the University opened its doors, two of which were interim. Of those men, two received their undergraduate degrees at MTSU. Dr. Quintin Miller Smith (Class of 1913) served as the third president from 1939 to 1958. Dr. Raymond Eugene Smith served as the ninth (interim) president from October 2000 to August 2001. MTSU can claim a Nobel Prize winner amongst its alumni. In 1986, James M. Buchanan (Class of 1940) won the Sveriges Riksbank Prize in Economic Sciences in Memory of Alfred Nobel. One alumnus is particularly close to our heart. Albert Gore, Sr. (Class of 1932) served Tennessee in both the House of Representatives (1938-1952) and the United States Senate (1952-1970). He participated in several University events and was recognized as Distinguished Alumni in 1960, the first year the award was bestowed. His papers are housed at the Albert Gore Research Center. Politicians, musicians, authors and other celebrities have frequently visited campus. One famous visitor was General Douglas MacArthur, who visited campus in 1951. His wife, Jean Faircloth MacArthur, was a Murfreesboro native. Truly, this blog only highlights the people who make the University what it is. MTSU has a rich history and its traditions carry on to today’s students. The archives will help to tell their story in years to come. This entry was posted in Uncategorized and tagged Albert Gore Sr., Archives, Middle Tennessee Teachers College, MTSU, Murfreesboro, political collections. Bookmark the permalink.